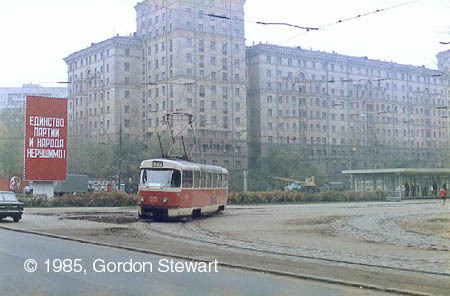 The first trams came from the center of Moscow to an iron plant named after Voikov in 1932. Years went by, and the plant's name became the name of the whole district, and later - the name of the Metro station. 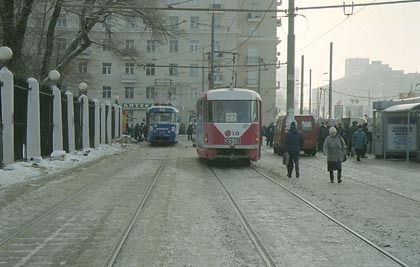 The tramline, although moved from main roads to side streets, survived all these years and runs today. The line once had a heavy freight traffic - in the years of the Great Patriotic War (1941-1945) it carried the iron plant production and raw materials. Today it moves great number of passengers to and from the Metro station Voikovskaya, built near the plant. Large park, cinemas, markets and stores along the line are also the important destination spots. 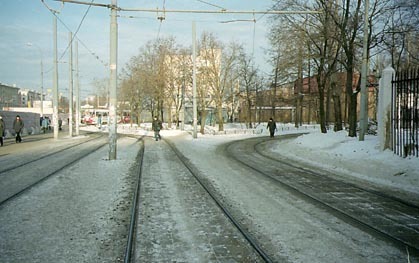 A view of the Voikovskaya station tracks. This terminus has just two departure tracks, although it could have more, as there is enough room for the third track. Another view of the tracks. 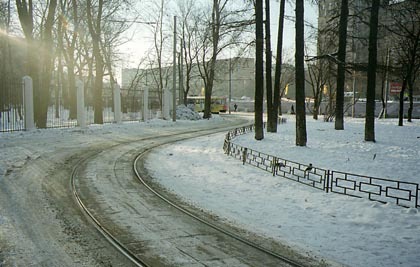 The departure tracks were relaid in 2000 because of supermarket construction near the metro entrance. When the construction was already half-way it appeared that the place had been unsuitable for many reasons, and the already erected structures have been demolished. The grade warning on the overhead. 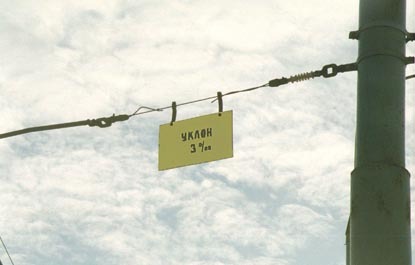 In fact, too little grade to be noticed, but such grade signs appeared in Moscow in great numbers during this (2001) year. ...namely this elegant pavilion. 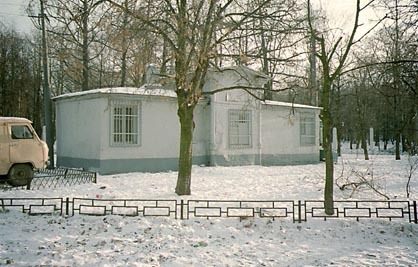 This building must be the former tram control station. It was constructed in the second half of 1930's, but now it is used simply as a storage facility, as I can guess. The terminus. As you can see, the routes do not suffer from the lack of passengers! 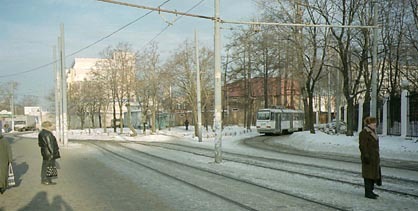 The departing tram in front of the huge dwelling houses of Stalin epoque along Leningradskoye Shosse. The place looks quite uncommon today - there are no booths surrounding the metro entrance yet, and this red slogan stating that the unity of the Communist Party and the people is unbreakable you will never find in Moscow today (I hope, for good).